the Merseyside Lodge of The Theosophical Society in England. There is a general ignorance of what Theosophy is. There are a number of reasons for this. When it first came to the notice of the public in 1875 it was associated with spiritualism, which was then much in vogue. Later some of H. P. Blavatsky's remarkable phenomena became known and these were inexplicable. This led to her becoming dubbed as a fraudulent medium and this view was upheld by the Society for Psychical Research in the content of a report by one of their members and particularly regarding the authorship of letters and other written material purporting to come from those she referred to as her Teachers or Masters of the Wisdom. Even though this report has been found defective by several independent investigators, its findings still remain to affect the views of academics and others who might otherwise have more regard for what Mme Blavatsky has written. Moreover, some of this was in a vein that offended orthodox churchmen. These attitudes of the academic world and the church led to Blavatsky's writings being ignored by the seriously scholarly fraternity. The public in general, where they were at all interested, were interested in the sensationalism that surrounded her. They too were affected by the taint of alleged charlatanry and fraud. Nevertheless, all Mme Blavatsky's writings have been continuously in print since her death and she is still a figure of interest. Books and articles about her continue to appear. They are often derogatory, even scurrilous. Slowly, however, the more serious and definitive biographies of her are being noticed. Much of the unfounded and misinformed opinion of her is being refuted. Nevertheless, much remains, particularly in those of a satirical turn of mind who regard themselves as her equal or even her superior in knowledge and intellect. They have not, however, been able to appreciate the scope and depth of what she wrote. Her complete vindication is in her writings, voluminous and of erudition second to none in the world. Against a background of modern scientific and religious orthodoxy their content is largely unacceptable. Given an open mind and some perseverance on the part of a more than superficial reader they are found to be of the greatest learning, making reference to all the recognized authorities of the past, and in themselves offering a profound and illuminating comprehensive philosophical-religious system which had never, in its entirety, been made public before. This present work is an attempt to demonstrate in outline only something of what the original literature contains. It is a compilation of selected descriptive and definitive statements taken from the subject matter in the great works. All the quotations are verbatim from the original text, with references, so that they can be looked up and seen in context. Taken together these extracts, while only touching on the massive amount of information contained in the works they are taken from, will at least give an idea of what the content of those works is all about. Its modern name is Theosophy. Theosophy is not a revelation. It is knowledge, possessed by the Masters of the Arcane Sciences from time immemorial, of the nature and processes of Cosmos -all Nature herself, both objective and subjective, i.e., her formative powers, energies and forces. It is sometimes referred to as the Ageless Wisdom. IT LIES AT THE ROOT OF EVERY MORAL PHILOSOPHY, RELIGION, AND SCIENCE. to purify the ancient religions, by degrees corrupted and obscured, from all dross of human element, by uniting and expounding them upon pure philosophical principles. a compassionate feeling for even the dumb animals. It is not possible to give a short but meaningful description of Theosophy because of its immense scope and depth. It relates to the inner (subjective) and outer (objective) realms of the whole cosmic scene and all that is in it, at all its various levels of being. Theosophy could be thought of as the Science of Life or the, Science of Sciences. It is science in the broadest, omnibus sense. It is all embracing knowledge but in its deeper inner aspects only possessed by the Initiates and Adepts. This is known as Esoteric Science, a synonym for Theosophy. One such Master Adept said "Modem Science is our best ally". He said this when it deals with facts and not hypotheses and opinions. ...it checks the discoveries of modem exact science, and shows some of them to be necessarily correct, since they are found corroborated in the ancient records. All this will, no doubt, be regarded as terribly impertinent and disrespectful, a veritable crime of lese-science; nevertheless, it is a fact. Mankind has devised for itself religion in many forms throughout the ages. Theosophy tells us that in its infancy humanity was so spiritual that individuals were aware of their own divinity. This was a fact of ordinary life for them. But with the densification of their material forms as the cycle of so-called involution (descent into matter) proceeded and the physical objective world occupied more and more of their attention, their inner spiritual faculty was lost. Men forgot their own true nature and God or Gods became externalised, assuming many forms, but ending as an anthropomorphic being with all human qualities and even weaknesses of character much magnified. Such gods could respond to supplication, could be appeased if they were angry, most important of all could forgive sins and grant eternal life. Yet there are, as every one knows, certain beliefs, philosophical, religious and scientific, which have become so closely associated in recent years with the word "Theosophy" that they have come to be taken by the general public for theosophy itself. Moreover, we shall be told these beliefs have been put forward, explained and defended by these very Founders who have declared that Theosophy is not a religion. Wha1 is then the explanation of this apparent contradiction? How can a certain body of beliefs and teachings, an elaborate doctrine, in fact, be labelled "Theosophy" and be tacitly accepted as "Theosophical" by nine-tenths of the members of the T. S., if Theosophy is not a Religion? - we are asked. Thus Theosophy is not a Religion, we say, but RELIGION itself, the one bond of unity, which is so universal and all-embracing that no man, as no speck - from gods and mortals down to animals, the blade of grass and atom - can be outside of its light. Therefore, any organisation or body of that name must necessarily be a UNIVERSAL BROTHERHOOD. At the time when Theosophy was being made available to the public in the writings of H. P. Blavatsky spiritualism in all its forms was attracting wide attention in both the United States and Europe. H. P. B. accepted the possibility of genuine phenomena but warned that there were many mediums practising fraudulently who brought the movement into general disrepute. For a long time the scientific fraternity would not countenance it at all - whether genuine or not. At the start of her career H. P. B. herself wrought many remarkable phenomena to demonstrate that it was possible for a qualified person who knew the appropriate laws of nature, to produce them. This, however, was inexplicable by and unacceptable to the body of orthodox scientists at the time. Fraud was the only explanation for them. In the passages that follow it will become evident that the theosophical view of 'Spirit' is in a sense quite different from that of the spiritualists. In the theosophical classification of the seven principles of man only the upper two and a half (i.e. Atman, Buddhi and the Higher Manas) are regarded as truly spiritual and immortal. They constitute the man's spirit that cannot 'communicate' through a medium. It is the psychic reliquae of the deceased that can, but only for a time after death. The following is an abridged collation from H. P. Blavatsky's The Key to Theosophy, in the form of an interview with her by an imaginary enquirer. ENQ. But do you not believe in spiritualism? THEO. If by "Spiritualism" you mean the explanation which Spiritualists give of some abnormal phenomena, then decidedly we do not. They maintain that these manifestations are produced by the "spirits" of departed mortals, generally their relatives, who return to earth to communicate with those they have loved, or to whom they are attached. We deny this point blank. We assert that the spirits of the dead cannot return to earth - save in rare and exceptional cases; nor do they communicate with men, except by entirely subjective means. That which does appear objectively, is only the phantom of the ex-physical man. But in psychic, and so to say, "Spiritual" Spiritualism, we do believe, most decidedly. ENQ. Do you reject the phenomena also? THEO. Assuredly not - save cases of conscious fraud. ENQ. How do you account for them, then? THEO. In many ways. The causes of such manifestations are by no means so simple as the Spiritualists would like to believe. Foremost of all, the deus ex machina of the so-called "materialisations" is usually the astral body or "double" of the medium, or of some one present. This astral body is also the producer, or operating force in the manifestations of slate writing. "Davenport"-like manifestations, and so on. ENQ. You say "usually;" what is it that produces the rest? THEO. That depends on the nature of the manifestations. Sometimes the astral remains, the Kama-Iokic "shells" of the vanished personalities that were; at other times, Elementals. "Spirit" is a word of manifold and wide significance. I really do not know what Spiritualists mean by the term; but what we understand them to claim, is that the physical phenomena are produced by the reincarnating Ego, the Spiritual and immortal "individuality". And this hypothesis we entirely reject. The Conscious Individuality of the disembodied cannot materialise, not can it return from its own mental Devachanic sphere to the plane of terrestrial objectivity. ENQ. But many of the communications received from the "spirits" show not only intelligence, but a knowledge of facts not known to the medium, ...the investigator, ...the audience. THEO. This does not necessarily prove that the intelligence and knowledge you speak of belong to spirits, or emanate from disembodied souls. Somnambulists have been known to compose music and poetry, and to solve mathematical problems while in their trance state, without having ever learnt music or mathematics. Others, answered intelligently to questions put to them, and even spoke languages, such as Hebrew and Latin, of which they were entirely ignorant when awake - all this in a state of profound sleep. Will you, then, maintain that this was caused by "spirits"? ENQ. But how you would explain it? ENQ. This means that you reject the philosophy of spiritualism in toto? ENQ. I was told that the Theosophical Society was originally founded to crush spiritualism and belief in the survival of the individuality in man. THEO. You are misinformed. Our beliefs are all founded on that immortal individuality. But then, like so may others, you confuse personality with individuality. The Western psychologists do not seem to have established any clear distinction between the two. Yet it is precisely that difference which gives the keynote to the understanding of Eastern philosophy, and which lies at the root of the divergence between the Theosophical and Spiritualistic teachings. And though it may draw upon us still more the hostility of some Spiritualists, yet I must state here that it is Theosophy which is the true and unalloyed Spiritualism, while the modern scheme of that name is, as now practised by the masses, simple transcendental materialism. ENQ. Please explain your ideas more clearly. THEO. What I mean is that though our teachings insist upon the identity of spirit and matter, and though we say that spirit is potential matter, and matter is simply crystallised spirit (e.g., as ice is solidified steam), yet since the original and eternal condition of all is not spirit but meta spirit, so to speak, (visible and solid matter being simply its periodical manifestation), we maintain that the term spirit can only be applied to the true individuality. ENQ. But what is the distinction between this "true individuality" and the "I", or Ego, of which we are all conscious? THEO. Before I can answer you, we must argue upon what you mean by "I" or "Ego". We distinguish between the simple fact of self-consciousness, the simple feeling that "I am I", and the complex thought that "I am Mr Smith" or "Mrs Brown". Believing as we do in a series of births for the same Ego, or re-incarnation, this distinction is the fundamental pivot of the whole idea. You see "Mr Smith" really means a long series of daily experiences strung together by the thread of memory, and forming what Mr Smith calls "himself'. But none of these "experiences" are really the “I”, or the Ego, nor do they give "Mr Smith" the feeling that he is himself, for he forgets the greater part of his daily experience, and they produce the feeling of Egoity in him only while they last. We Theosophists, therefore, distinguish between this bundle of "experiences", which we call the false (because so finite and evanescent) personality , and that element in man to which the feeling of "I am I" is due. It is this "I am I" which we call the true individuality; and we say that this "Ego" or individuality plays, like an actor, many parts on the stage of life. Let us call every life on earth of the same Ego a night on the stage of a theatre. One night the actor, or Ego, appears as Macbeth, the next as Shylock, the third as Romeo, the fourth as Hamlet or King Lear, and so on, until he has run through the whole cycle of incarnation The Ego begins his life-pilgrimage as a sprite, an Ariel, or a Puck; 1 plays the part of a super, is a soldier, a servant, one of the chorus; rises then to speaking parts, plays leading roles interspersed with insignificant parts, till he finally retires from the stage as Prospero, the magician. ENQ. I understand. You say that this true Ego cannot return to earth after death. But surely the actor is at liberty, if he has preserved the sense of his individuality, to return if he likes to the scene of his former actions? The knowledge of Theosophy is more properly philosophy itself. In the limit Theosophy is all knowledge - literally omniscience. This is only the case, however, with the great Souls who have attained to that degree of enlightenment. This is the grand achievement of the fully developed Adept or Master of Wisdom. The great philosophers of the past may have been Initiates into the mysteries but the fact that many may have been members of Arcane School meant they were under a vow of strict secrecy that prevented them from speaking or writing anything that touched on the deeper aspects of the true occult nature of existence. This is a factor of which those who try to assess their teaching against ordinary views cannot have regard. Occultism is the comprehensive knowledge of the subjective inner world and their processes, an outline of which was given out in the writings of H. P. Blavatsky. These writings contained some material never before made public. A distinguishing feature of Theosophy as then propounded, is that is not speculative as is much other philosophy. It is based on an actual knowledge in its infinitude, depth and extent of the all-embracing nature of Nature (the manifest Cosmos) and her processes (the Law). The answer to what Theosophy is begins to dawn as we study its literature, observe our fellow humans, experience the exigencies of our lives, and become aware of Nature, her ways and her creatures. Later we sense our own conscious livingness, and begin to sense perhaps that in it we are sharing something vital with all others: men, animals and even plants. In a letter written by H. P. Blavatsky this sensing is referred to as "the living and breathing spirit of Truth and an ever growing Knowledge" (CW IX, 244). The advent of Theosophy was meant to counteract prevalent materialism. "For by 'materialism' is meant not only an anti-philosophical negation of pure spirit, and, even more, materialism in conduct and action -brutality, hypocrisy, and, above all, selfishness, -but also the fruits of a disbelief in all but material things. .." (CW IX, 244). The sub-title to The Secret Doctrine says it is 'The Synthesis of Science, Religion and Philosophy' and equates it to Theosophy. IT SEEKS THE ONE TRUTH. IT IS ALLIED WITH EVERY SEARCHING MAN. IT IS A MYSTICAL PERCEPTION OF THE INTERIOR WORLD. THE AWAKENING OF THE INNER MAN. THE ASPIRANT MUST LIVE FOR OTHERS, NOT FOR HIS OWN LITTLE SELF. DEAL JUSTLY AND WALK HUMBLY. FIRST HE MUST FIND HIMSELF. In the words of a true Philaletheian: "What every man needs first is to find himself, and then take an honest inventory of his subjective possessions, and, bad or bankrupt as it may be, it is not beyond redemption if we set about it in earnest." But how many do? All are willing to work for their own development and progress; very few for those of others. BREAK IDOLS, PUT AWAY SHAMS. The phrases in the selected passages below emphasize some of the aspects of ethics for the guidance of would-be theosophists. These centre on the elimination of selfishness. This means a transference of interest from the limited personal to the unlimited "impersonal", from the specifically egocentric to the universal. The saying that Theosophy is altruism is an expression of this shift. The technical considerations behind this lie in the theosophical constitution of man as a tripartite being. He is regarded as primarily spiritual, with an emotional or psychic nature and a physical body. In the teaching the tripartite classification is expanded into a sevenfold one wherein his physical principles are threefold, his psychic twofold and his highest spiritual nature threefold (the psychic and the spiritual share the mental principle). His spirituality reflects the essential Being of the Universe up the highest level according to the man's development. Consciousness at this level transcends completely the purely personal with its private concerns. Consciousness becomes liberated and the man's mental view expands embrace the cosmic whole with everything in it, including all human whatever its condition. Virtue is the hallmark of the developed theosophist and this necessarily includes compassion. The literature of the Ancient Wisdom comes to us out of the remotest antiquity. There has been a continuous thread cropping up in all the civilizations the world has seen. The writings have come from a numberless series of knowers who have bestowed on humanity works of devotion, inspiration, ethics, philosophy, even of a transcendental psychology. The knowers, however, have been initiates in the arcane mysteries with secrets which they could never reveal at the heart of their lore. These secrets concerned the inner nature of Nature (the manifest herself and of her laws and processes. Among the secrets was how man related in every respect to Nature. His nature reflected in miniature (microcosm) that of Great Nature herself (Macrocosm) in every respect. More than had ever before been made public was given out to the world in the writings of H. P. Blavatsky (an initiate in her own right) and of her Teachers, Masters of the Wisdom. These writings included importantly THE SECRET DOCTRINE. There were others. Much of the material in this Section is of great significance and depth. For most students the concepts - and all their ramifications - will be new. Repeated reading with much thought is required for the concepts fully to be appreciated, at first singly and then as a comprehensive whole. Later when the great cosmic principle of UNITY is apprehended it is found that the fundamental teachings relate to man himself. Then comes the realisation that concerns the inmost nature of each of us. We are "THAT". Before the reader proceeds to the consideration of the Stanzas from the Book of Dzyan which form the basis of this present work, it is absolutely necessary that he should be made acquainted with the few fundamental conceptions which underlie and pervade the entire system of thought to which his attention is invited. These basic ideas are few in number, and on their clear apprehension depends the understanding of all that follows [in The Secret Doctrine]. (a) An Omnipresent, Eternal, Boundless, and Immutable PRINCIPLE on which all speculation is impossible, since it transcends the power of human conception and could only be dwarfed by any human expression or similitude. It is beyond the range and reach of thought -in the words of Mandukya Upanishad, "unthinkable and unspeakable." To render these ideas clearer to the general reader, let him set out with the postulate that there is one absolute Reality which antecedes all manifested, conditioned, being. This Infinite and Eternal Cause - dimly formulated in the "Unconscious" and "Unknowable" of current European philosophy -is the rootless root of "all that was, is, or ever shall be." It is of course devoid of all attributes and is essentially without any relation to manifested, finite Being. It is "Be-ness" rather than Being (in Sanskrit, Sat), and is beyond all thought or speculation. Parabrahman (the One Reality, the Absolute) is the field of Absolute Consciousness, i.e., that Essence which is out of all relation to the conditioned existence, and of which conscious existence is a conditioned symbol. But once that we pass in thought from this (to us) Absolute Negation, duality supervenes in the contrast of Spirit (or consciousness and Matter, Subject and Object. Spirit (or Consciousness) and Matter are, however, to be regarded, not as independent realities, but as the two facets or aspects of the Absolute (Parabrahman), which constitute the basis of conditioned Being whether subjective or objective. Considering this metaphysical triad as the Root from which proceeds all manifestation, the Great Breath assumes the character of pre-cosmic Ideation. It is the fons et origo of force and of all individual conscious-ness, and supplies the guiding intelligence in the vast scheme of cosmic Evolution. On the other hand, pre-cosmic root-substance (Mulaprakriti) is that aspect of the Absolute which underlies all the objective planes of Nature. Hence it will be apparent that the contrast of these two aspects of the Absolute is essential to the existence of the "Manifested Universe." Apart from Cosmic Substance, Cosmic Ideation could not manifest as individual consciousness, since it is only through a vehicle of matter that consciousness wells up as "I am I," a physical basis being necessary to focus a ray of the Universal Mind at a certain stage of complexity. Again, apart from Cosmic Ideation, Cosmic Substance would remain an empty abstraction, and no emergence of consciousness could ensue. But just as the opposite poles of subject and object, spirit and matter, are but aspects of the One Unity in which they are synthesised, so, in the manifested Universe, there is "that" which links spirit to matter, subject to object. *Called by Christian Theology archangels, seraphs, etc. (I). The ABSOLUTE; the Parabrahman of the Vedantins, or the one Reality, SAT, which is, as Hegel says, both Absolute Being and Non-Being. (2). The first manifestation, the impersonal, and, in philosophy, unmanifested Logos, the precursor of the "manifested." This is the "First Cause," the "Unconscious" of European Pantheists. (3). Spirit-matter, LIFE; the "Spirit of the Universe," the Purusha and Prakriti, or the second Logos. (4). Cosmic Ideation, MAHAT or Intelligence, the Universal World-Soul; the Cosmic Noumenon of Matter, the basis of the intelligent operations in and of Nature, also called MAHA-BUDDHI. In its absoluteness, the One Principle under its two aspects (of Parabrahman and Mûlaprakriti) is sexless, unconditioned and eternal. Its periodical (manvantaric) emanation - or primal radiation - is also One, androgynous and phenomenally finite. When the radiation radiates in its turn, all its radiations are also androgynous, to become male and female principles in their lower aspects. After Pralaya, whether the great or the minor Pralaya (the latter leaving the worlds in statu quo**), the first that reawakens to active life is the plastic Akasa, Father- Mother, the Spirit and Soul of Ether, or the plane on the surface of the Circle. Space is called the "Mother" before its Cosmic activity, and Father-Mother at the first stage of reawakening. In the Kabala it is also Father-Mother-Son. But whereas in the Eastern doctrine, these are the Seventh Principle of the manifested Universe, or its "Atma-Buddhi-Manas" (Spirit, Soul, Intelligence) , the triad branching off and dividing into the seven cosmical and seven human principles, in the Eastern Kabala of the Christian mystics it is the Triad or Trinity, and with their occultists, the male-female Jehovah, Jah-Havah. In this lies the whole difference between the esoteric and the Christian trinities. The Mystics and the Philosophers, the Eastern and Western Pantheists, synthesise their pre genetic triad in the pure divine abstraction. The orthodox anthropomorphise it. Hiranyagarbha, Hari, and Samkara - the three hypostases of the manifesting "Spirit of the Supreme Spirit" (by which title Prithivi - the Earth – greets Vishnu in his first Avatara) - are the purely metaphysical abstract qualities of formation, preservation, and destruction, and are the three divine Avasthas (lit. hypostases) of that which "does not perish with created things" (or Achyuta, a name of Vishnu); whereas the orthodox Christian separates his personal creative Deity into the three personages of the Trinity, and admits of no higher Deity. The latter, in Occultism, is the abstract Triangle; with the orthodox, the perfect Cube. The creative god, or the aggregate gods, are regarded by the Eastern philosopher as Bhrantidarsanatah – ‘false apprehension’, something ‘conceived of by reason of erroneous appearances, as a material form’, and explained as arising from the illusive conception of the Egotistic personal and human Soul (lower fifth principle) .It is beautifully expressed in a new translation of Vishnu-Purana: "That Brahmâ, in its totality, has, essentially, the aspect of Prakriti, both evolved and un-evolved (Mûlaprakriti), and also the aspect of spirit and the aspect of Time. Spirit, O twice-born, is the leading aspect of the supreme Brahma. The next is a twofold aspect - Prakriti, both evolved and un-evolved, and time is the last". **It is not the physical organisms that remain in statu quo, least of all their physical principles, during the great Cosmic, or even Solar, pralayas but only their Akashic, astral, 'photographs' .But during minor pralayas, once overtaken by the 'Night', the planets remain intact, though dead, as a huge animal, caught and imbedded in the polar ice, remains the same for ages. Kronos (Chronos) is shown in the Orphic theogony as being also a generated god or agent. In the last few weeks of her life H. P. Blavatsky had about her a small group of students to whom she gave some important instruction. In this group was a Commander Robert Bowen. Bowen made notes of some of their conversations and his notes were later found. They formed the basis for a small booklet to which was given the title "Madame Blavatsky on how to study Theosophy". This gave some general advice on how to approach the study of Theosophy and in particular her great work The Secret Doctrine. In her talks to the Group she was helpfully explicit on a number of points, shedding the light of her great knowledge on them. A full reiteration of these points is unnecessary here but quotations from the booklet are made in this section. (a) The FUNDAMENTAL UNITY OF ALL EXISTENCE. This unity is a thing altogether different from the common notion of unity -as when we say that a nation or an army is united; or that this planet is united to that by lines of magnetic force or the like. The teaching is not that. It is that existence ONE THING, not any collection of things linked together. Fundamentally there is ONE BEING. The BEING has two aspects, positive and negative. The positive is Spirit, or CONSCIOUSNESS. The negative is SUBSTANCE, the subject of consciousness. This Being is the Absolute in its primary manifestation. Being absolute there is nothing outside it. It is ALL-BEING. It is indivisible else it would not be absolute. If a portion could be separated, that remaining could not be absolute, because there would at once arise the question of COMPARISON between it and the separated part. Comparison is incompatible with any idea of absoluteness. Therefore it is clear that this fundamental ONE EXISTENCE, or Absolute Being, must be the REALITY in every form there is. Did the Ancients know of worlds besides their own? What are the data of the Occultists in affirming that every globe is a septenary chain of worlds - of which only one member is visible - and that these are, were or will be, "man bearing," just as every visible star or planet is? What do they mean by "a moral and physical influence" of the sidereal worlds on our globes? These warnings must be seen against a background of the teachings concerning the occult nature of man (both genders) .In them he is sevenfold - his three higher principles (upper Manas, Buddhi and Atma) are purely spiritual, transcending completely the personal man; they are in effect immortal, providing the limited earthly man with his sense of "I" and his inherent consciousness. They are, however, utterly impersonal, unlimited by any constraints of the personal beings they overshadow during their lives. Further, they cannot be tainted or affected by any gross results of the lives of their periodical incarnations at physical level - ordinary men and women. The personality on the other hand is temporary .It is mortal, impure spiritually as a result of passions, appetites of all sorts, self-interest, ambition at the expense of others, etc., etc. It comprises the four lower principles of the septenary, i.e. the mento-emotional or psychic and those relating to and including the physical body. All of us at this level are conditioned. Our concern is for the things of the lower self, the very antithesis of what must apply to the aspiring spiritual man or he who would enter into the arcana of Occult Wisdom, or Theosophy. THE "GREAT RENUNCIATION OF SELF"
Edited by Boris De Zirkoff; [14 Vols]; Theosophical Publishing House, Wheaton. H. P. Blavatsky; [3 Vols]; Theosophical Publishing House, Adyar. H. P. Blavatsky; (unabridged, verbatim reprinting of the 1889 First Edition); Theosophical University Press, Pasadena. Madame Blavatsky on how to study Theosophy; The Theosophical Society in England. There is a very wide literature covering the subjects dealt with in this book but the writings of H. P. Blavatsky have been taken to be the mos1 informative and authoritative that there are available. Her knowledge was from two sources, one her Initiate Teachers and second her own insights, her own apperception, her intuition resulting from great inherent gifts and intense training. Her Teachers also committed much to writing, a very rare occurrence where genuine Occultism is concerned. 1. ISIS UNVEILED: 1877; J. W. Bouton, New York; subtitle: A Master Key to the Mysteries of Ancient and Modern Science and Theology; , large work in two volumes of over 600 pages each. This is a mine of information, some of it very little known, and a mass o enlightened comment on the science and theology of the day. While som< of this is out of date, much in the book is of an enduring nature. This book while being regarded by some as iconoclastic, is liberating. It helps us 1< free ourselves from our prejudices and preconceptions. It is in a number o editions, by various publishers, but the text is the same in them all. 2. THE SECRET DOCTRINE: 1888; The Theosophical Publishing Company, London; subtitle: The Synthesis of Science, Religion and Philosophy; two volumes of some 1500 pages altogether. This is a massive work of great erudition, some 1100 other works being referred to in the text. It outlines the vast scheme of knowledge of the nature and function of Cosmos available to mankind in the extensive world literature on the subject and adds some items of great significance, not previously given out. In spite of the work's extent and depth, H. P .B. say that in it only "a corner of the veil" was lifted. In her preface H. P. B. says, "The aim of this work may thus be stated: to show that Nature is not a fortuitous concurrence of atoms' and to assign to man his rightful place in the scheme of the Universe, etc. etc." She further says that it, The Secret Doctrine, is as much as 20th century man can apprehend. 3. THE KEY TO THEOSOPHY: 1889; numerous editions about 250 pages; "Dedicated by H. P. B. to all her pupils that they may Learn and Teach in their turn". This book covers the main aspects of the teaching as they affect mankind. She discusses among others the Wisdom-Religion, Occultism, Spiritualism, God and Prayer, the septenary Nature of Man, the After-death states, Reincarnation, the Complex Nature of Mind, Karma, etc. etc. ; all this by way of question and answer. 4. THE VOICE OF THE SILENCE: 1889; numerous editions; about 250 pages; subtitle: Chosen Fragments from the " Book of the Golden Precepts" - for the Daily Use of Lanoos [Disciples]; it is "dedicated to the Few". This is a book small in volume but massive in content. It is in three Fragments: the first entitled The Voice of Silence, of loo verses; the second, The Two Paths, of 95 verses; the third, The Seven Portals, of 120 verses. This is a work intended for the aspirant after true, or self, knowledge, aiming to playa significant part in helping mankind along its arduous evolutionary path to ultimate self-redemption and liberation. 5. THE COLLECTED WRITINGS: edited by Boris de Zirkoff; 14 volumes. This is a collection of H. P. B. 's numerous writings by way of articles, stories, some published letters and so on, written during the period 1875 to 1891, arranged chronologically. These writings contain much teaching which supplements (and is entirely consistent with) what is contained in her books. Some of the material gives an insight into how the teachings could affect the lot of humanity in the circumstances of earth life, having regard to its traditions, institutions, ignorances, superstitions and so on. They are particularly illuminating on such subjects as spiritualism, the Christian religion, and Occultism generally. Always H. P. B. has an eye to essentials, to objective facts, which she sees clearly against the background of her encyclopaedic knowledge. In these works is to be found much wisdom and inspiration. 6. THE MAHATMA LETTERS TO A. P. SINNETT: 1923; first published by Rider & Co., London; 500 pages; 2 editions plus a 3rd with the letters in chronological order (1993). This is a volume of letters received from H. P. B. 's two initiate Teachers, in answer to questions put to them mostly by A. P. Sinnett with some by A. 0. Hume. The letters contain much metaphysical and philosophical teaching in the occult tradition, among much material relating to the early days of the Theosophical Society and the people in or associated with it. Many aspects of the teaching, among them those relating to the after-death states, are unique, having been kept secret up to that time. This is a book essential to any serious student of modern Occultism. It is the source of the main principles of the subject given and elaborated in H. P. B. 's writings. Most of the letters were received in the period 1880-1886. 7. TRANSACTIONS OF THE BLAVATSKY LODGE: Theosophical University Press, Covina, California. A collection of notes, in question and answer form, taken at a series of meetings of the Lodge, in the first six months of 1889, at which H. P. B. was present. THE SECRET DOCTRINE AND ITS STUDY. This booklet is a compilation from The Secret Doctrine and Isis Unveiled, of excerpts which summarize the principle aspects of the great teaching. 9. 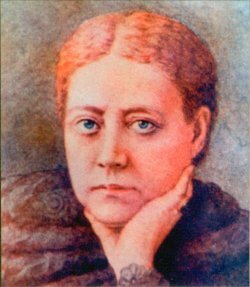 MADAME BLAVATSKY ON HOW TO STUDY THEOSOPHY: The Theosophical Publishing House; 15 pages. This is a booklet, referred to in the text as the 'Bowen Notes', containing material written down by Robert Bowen from talks which Madame Blavatsky gave to those near her during the close of her life. The content is in the form of important hints to students. 10. ESOTERIC BUDDHISM: A. P. Sinnett; Theosophical Publishing House. A book first published in 1885 from material received by A. P. Sinnett in letters (see 6 above) from the two Adepts who instigated through H. P. B. the founding of the Theosophical Society. It made a connected narrative of much information about the esoteric side of Nature, not made public before. The Theosophical Publishing House, Adyar, India; 520 pages. This book deals with aspects of the subject as doctrines, twelve of them. Within each of these, information relating to it throughout the main work has been collected together in an orderly fashion; a valuable student book. 12. DEITY, COSMOS AND MAN: G. A. Farthing; Point Loma Publications. This book epitomizes the main tenets of the theosophical teachings given in the original classical literature of the Theosophical Society listed in this Bibliography. 13. LETTERS THAT HAVE HELPED ME: W. Q. Judge. He was one of H. P. B. 's early collaborators in founding the Theosophical Society and was himself a long-time pupil of her Master. First published 2000 by The Theosophical Publishing House, London.